If you’re looking for things to do in the Drakensberg, Cathedral Peak Hotel is your ultimate activity paradise. We want every guest to come and find their adventure in the heart of the Drakensberg, and all around Cathedral Peak Hotel awaits plenty to explore. Guests can choose from 18 different walks and hikes that range from gentle strolls down the riverside, the Cathedral Four, to scaling the summit of Cathedral peak itself. Every single one of these wondrous journeys are complementary to guests of the hotel. For those looking for a bit more speed in their trips outside there are various mountain bike trails, a jogging route, horse rides, quad biking, and helicopter sightseeing flights nearby. Sport in the sun can be found in ample variety at our hotel with tennis, lawn bowls, outdoor chess, beach volleyball, badminton, a climbing tower, and both heated and cold swimming pools right outside your doorstep. The crowning jewel is our resort’s very own 9-hole golf course that also has alternate tees for an 18-hole game. Your round will range a glorious 5542m all across the valley with an ending at a beautiful clubhouse terrace that boasts a panoramic view of the mountains, a lounge area and pub. 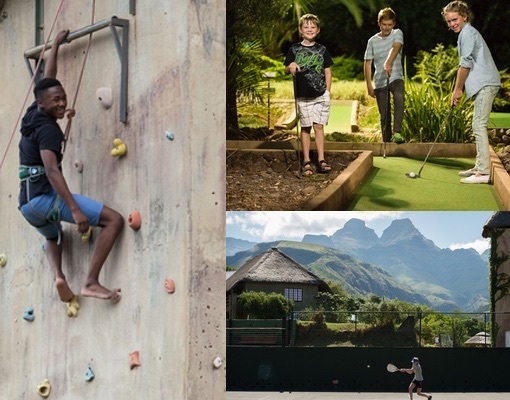 If you’re looking for things to do in the Drakensberg, you can be sure to find them at Cathedral Peak Hotel. On days when the outdoors presents itself as a little too wet, Cathedral Peak Hotel has more than enough to offer to keep any traveler busy. 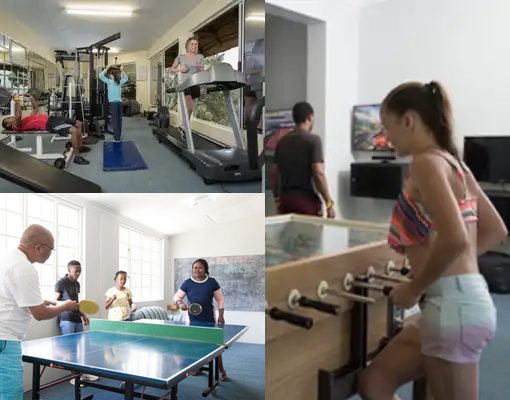 For the energetic among us there is a games room, table tennis, squash and a fully equipped gym with a steam bath. When looking for some inner peace, the hotel’s Wellness Centre will pamper you with various treatments by our professional therapists. When hunger calls, send your taste buds on a journey with extensive buffets both at breakfast and dinner, prepared by our team of top-class chefs. Even the little ones are taken care of with a separate children’s dining room with nutritious meals, toys and entertainment. Finally you can relax and reminisce at Albert’s Cocktail bar next to a roaring log fire. Or you could keep the day going long into the night at Harry’s Bar with a game of pool or darts, or take in some sport viewing on the big screen.